FUTURE VOICE offers freelance staff members the opportunity to work together in the field of our educational work. We offer: Free lecturer activities on a fee basis. Priority field of activity: Brennpunktschulen Berlin. Time frame: Block lessons (school semester) and project days. We are looking for: Reliable colleagues with experience in the educational work with children and youngsters. Knowledge in the field of child and human rights, DaF certificate, Experience in the creative implementation of educational offers - is an advantage. We welcome supporters for our new project YOUTHS FOR YOUTHS. FUTURE VOICE trains young people between the age of 14 and 19 to become Children's and Human Rights mentors. We are empowering them to work independently for these rights, especially in their age group. We collect the activities in this program on a long-term basis in a network that schools and youth organizations can access in order to bring children's and human rights issues to their classes and youth groups with the support of young mentors. YOUTHS FOR YOUTHS is part of our new series > EVOLUTION. Currently we are looking for educational partners/school with Welcome/- Language classes in Berlin to continue our newspaper project with young refugees. ... is a newspaper project for language classes, by and with young refugees. Therein, we give young people with special stories the opportunity to make their voices audible and visible. The project fosters the integration of the participants, their creative talents and their German language skills. Four editions of the newspaper have already been created. These are available online > FUTURE KIDS | Voices. 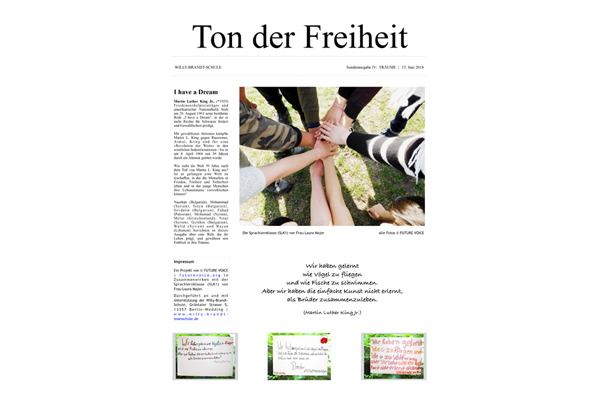 TON DER FREIHEIT is one of the winners of the RESPEKT GEWINNT competition 2018. Together for education | Help us! Become a supporter and foster young people sustainable in their ambition for education, participation and their wish to be heard. In this capacity, you can provide valuable support in your close environment. You'll be able to check the process and the results of our work face to face. You will be presented as a supporter in the course of our public work for the workshop and you can integrate the cooperation into the presentation of your company. Your donation is tax deductible and you will get a donation receipt. FUTURE VOICE is a non-profit organisation registered in Germany, located in Berlin. We are looking forward to welcome you. Please don't hesitate to come in contact for further questions.